The story of Subaru’s success in America begins with the humble 360. Entrepreneur Malcolm Bricklin was exploring the idea of renting scooters through a network of gas stations. Bricklin traveled to Japan to meet with Fuji Heavy Industries, the manufacturer of the Rabbit scooter to arrange for the importation of their scooters. At the meeting, Bricklin saw Fuji’s Subaru 360 microcar, known in Japan as the “Ladybug”, which got up to 60 miles to a gallon of gas. Because it weighed less than 1,000 pounds, the 360 did not require federalizing in the United States. Along with fellow entrepreneur and partner Harvey Lamm, Bricklin was able to secure an exclusive contract with FHI to import Subaru cars and trucks into the United States. Bricklin and Lamm established Subaru of America (SoA) in February of 1968. The 360 was given a scathing review by Consumer Reports in 1969. In response, SoA began to focus their meager advertising budget in rural areas of the country that had less readership of Consumer Reports than urban areas, specifically in New England and the Northwest. These snowier regions also happened to have a relatively unmet need for four-wheel drive vehicles. Subaru saw an opportunity to sell fuel efficient, reliable four-wheel drive cars to people that didn’t need a traditional pickup truck. In 1975, SoA brought in 7,000 four-wheel drive DL wagons from Japan and sold every last one of them without a national advertising campaign. Long before the heyday of the SUV, a niche was born. Malcolm Bricklin left Subaru in 1971, just as the 360 was being phased out. Bricklin acquired 900 unsold Subaru 360s, removed the bodies from the chassis, and then hired dune buggy designer Bruce Myers to design a durable plastic body. Bricklin had a racetrack built and charged people $1.00 a lap to race. He called it FasTrack, a turn-key, racing franchise upon which the public could drive on a custom-built race course. This venture led Bricklin to the idea of an ultra-safe sports car, whichbecame his gull-winged SV-1, debuting in 1974. Production of the SV-1 ended the following year. Bricklin returned to importing foreign cars, including the Bertone X 1/9 and the infamous Yugo. Subaru eventually replaced their four-wheel drive systems with more fuel efficient and less complicated all-wheel-drive systems. In 1995, Subaru made all-wheel drive standard on all of its models, a trend it continues to the current day. The SUV boom of the 1990s, along with clever marketing campaigns, helped to grow the Subaru brand in America. Beginning in 2009, Subaru achieved a nine-year streak of consecutive U.S. sales records, selling nearly 650,000 vehicles and becoming the eighth-largest selling automotive brand in the US in 2017. 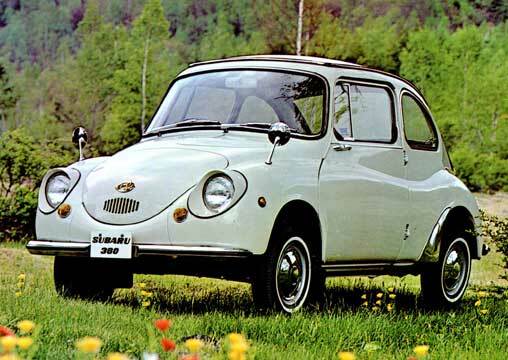 From its humble beginnings with the 360 microcar to its best-selling line of crossovers and performance sedans today, Subaru has come quite a ways in the last half-century.